Elementary art teacher Kathy Bailey squealed with excitement when she saw the stack of brightly-colored aprons piled neatly on a table beside a sewing machine. "Look at all these! They are wonderful!" she said holding up one of the aprons and gently putting it over the head of a third-grade student who had just finished sewing. Bailey said she's thrilled next year Lee and Page elementary art students will get to wear the colorful aprons when they start painting and doing pottery. 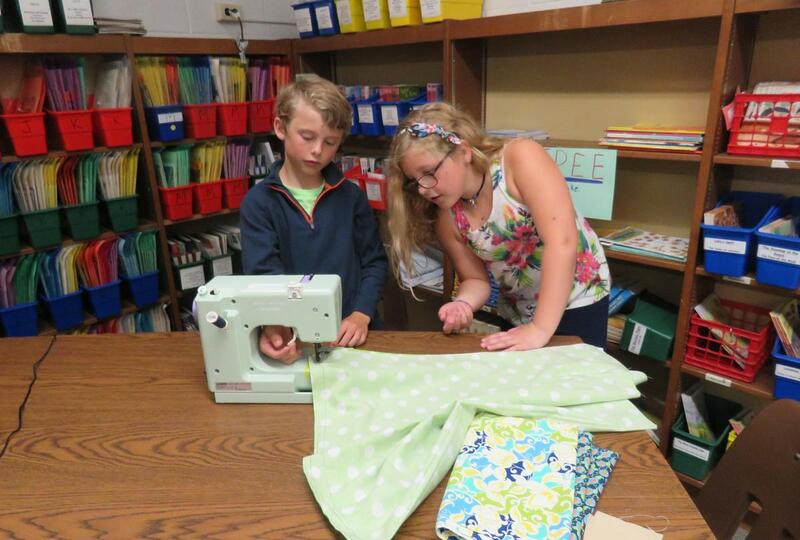 The third graders who sewed the aprons seemed equally as excited about their handmade work. 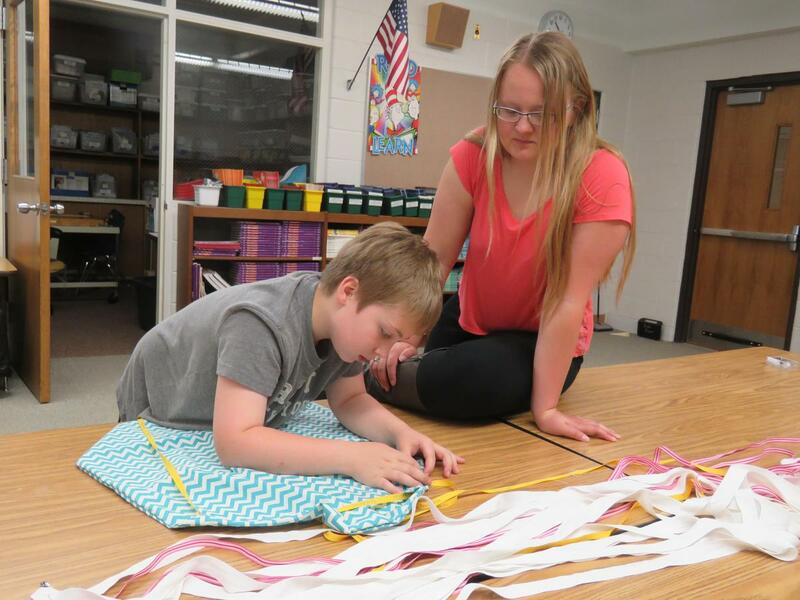 Students in Krissta Hannapel's and Marc Lester's classrooms took on the end-of-the-year project as a way of giving back and doing something for others. Hannapel said the service project was also educational and provided a chance for students to try something new. An e-mail from Bailey seeking art supplies for next year sparked the idea for the sewing project. 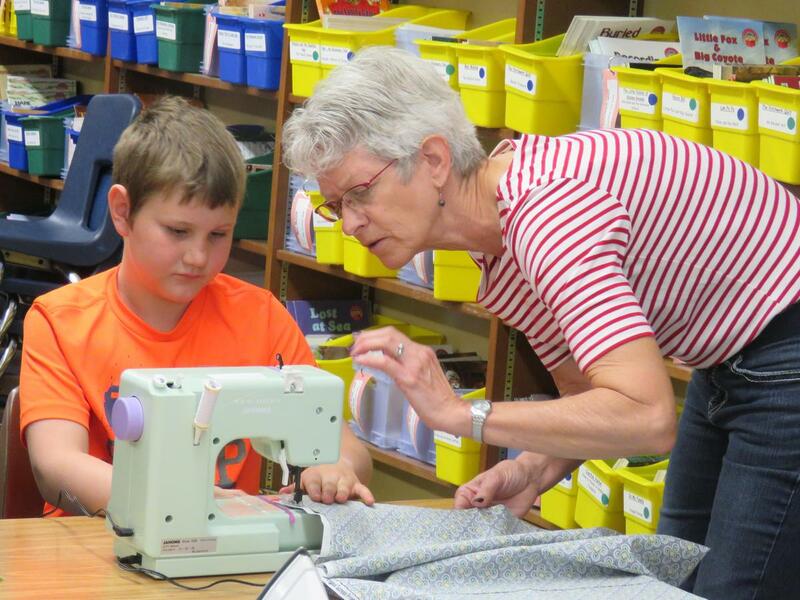 With a little help from some parent and senior volunteers and some shared sewing machines from the TK Senior Center, third graders got to work making aprons. For many, it was the first time they had ever used a sewing machine. 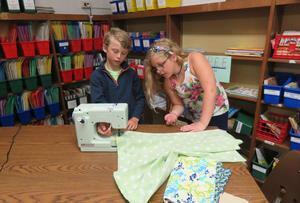 Max Durkee paid careful attention as he guided the material through the sewing machine. He said he's sewn before, but never made an apron or anything like it. "I think it's pretty cool. 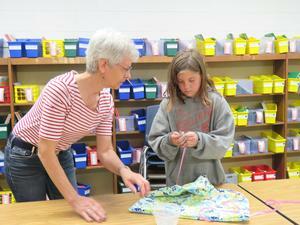 It's going to be neat to get to wear them next year in art class," said Durkee. Saige Clous helped her third-grade classmates navigate the use of the machines. 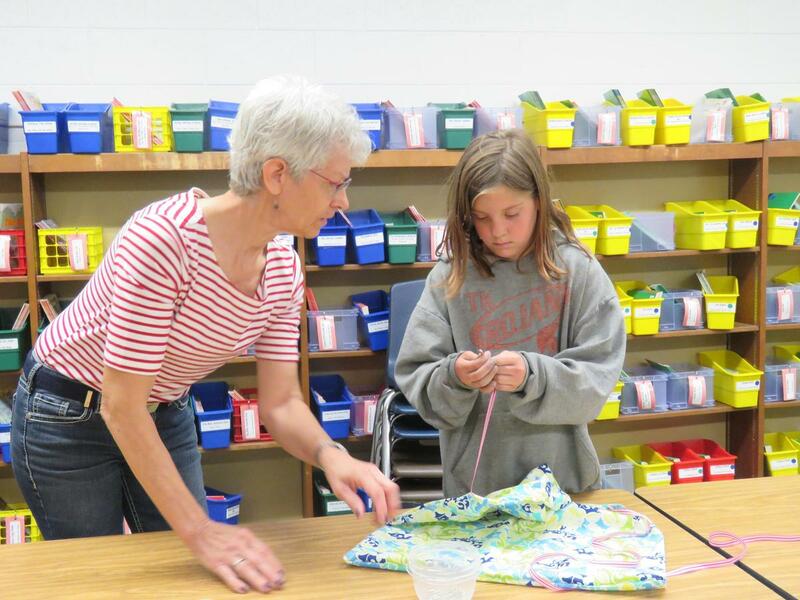 She even prepared a tutorial video to help show the third-graders how to sew. "I like to sew because I can make a lot of different projects and stuff," said Saige. Her mother, Erin Clous, has extensive sewing experience and sells her handmade clothing items online. She said the project was a fun way to work with her daughter and the other third graders and teach them a skill that many people no longer use. Erin provided all the scrap materials needed, pre-cut the shapes for the aprons and helped hand-tack the apron strings to put the finishing touches on the sewn projects. Some members of the TK Senior Center also donated their time to help with the project. The senior center also let the Lee students borrow some of their sewing machines so several students could be working at the same time. Before putting the needle and thread to the apron projects, students were introduced to the sewing machines and how they work with a practice session. "It was intergenerational. It was giving of their time and talent and doing something for others," said Hannapel. "They all did great. A few were tentative at first, but they all did it and I think they enjoyed it," said Hannapel. She's most happy that the project fills a need for Bailey's art classes. 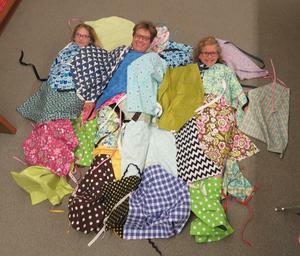 And next year when students put on the brightly-colored aprons, some will know they had a hand in making them.